FSS is a key supplier of heavy duty evidence lockers with high security, pass thru and non-pass thru operation for use in police stations and courtrooms. Our evidence locker storage solutions are perfect for temporary evidence storage and transfer from a non-secured area to an evidence storage room. Each evidence storage unit can be configured differently with various size compartments and can also be available with a refrigerator insert. 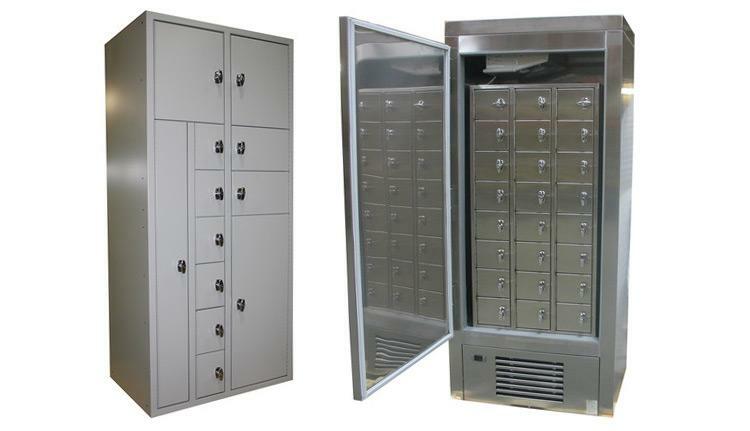 Our individual evidence lockers have compartment doors and frames that are constructed of heavy 16 gauge formed steel. We also use 16 gauge piano hinges for each unit and they are secured with keyless front entry latches or master keyed snap locks. The officer simply opens the evidence locker compartment and puts in the evidence with the proper documentation, closes the door and operates the latching system. The evidence technician then uses the key to open the locker and collect the necessary evidence. The latch on the evidence storage unit is then reset to be used again. We supply evidence lockers in many standard sizes, or we can match the configurations of other evidence lockers to suit your needs. Contact FSS today to discuss our available sizes, tracking systems, and electronic locking mechanism options and to explore the various types of construction for your police evidence storage.